Sitcoms don’t really lend themselves to ambition, and the the ones that have strived for more nontraditional presentations (The Good Place notwithstanding) tend not to have the best track record—just look at Mixology or Julia Louis-Dreyfus’ misbegotten Watching Ellie. Character and comedy are the driving forces of a good sitcom, so layering in a lofty concept has the potential to distract from the format’s simple pleasures. Me, Myself & I’s central gimmick—following one character, Alex Riley, across three pivotal times in his life—is so quietly subversive because it simultaneously enhances the sitcom’s familiarity as it alters the way one delivers laughs, lessons, and emotional resonance. By showing how a single decision or relationship can ripple throughout the years, the show has the ability to establish stakes and earn unexpected comedic and emotional payoffs in ways other shows of its ilk can’t. We see that potential fulfilled in the series’ very first episode. Jack Dylan Grazer, so hilarious in this year’s It, plays Alex as an awkward 14-year-old in 1991 whose life is uprooted when his mother remarries and relocates them to Los Angeles. There, a spark develops between him and cool gal Nori Sterling, but when things go south between the two of them we discover that Alex coped with his embarrassment by never speaking to her again. That’s pretty standard sitcom fare — a one-off story of romance and humiliation that’s (presumably?) never referenced again — but the show surprises when 65-year-old, newly retired Alex (John Larroquette) stumbles upon Nori in 2042, this time determined not to blow it with his dream girl. Here, the plot of one story directly impacts one taking place half a century later, and the weight of those intervening years is keenly felt. 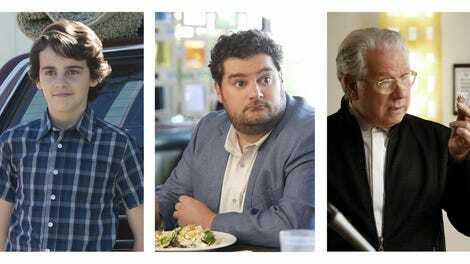 Bridging those two stories and, in essence, serving as the show’s anchor, is the adventures of 40-year-old Alex, here played by Saturday Night Live alum Bobby Moynihan. Down on his luck, this Alex is a struggling inventor living in the (two-car) garage of his friend Darryl (Jaleel White, more Stefan then Steve) after stumbling upon his wife, Sarah, (Allison Tolman), having an affair. As divorce looms, Sarah announces she’ll be moving away with their daughter, Abby, which sends Alex into that much more of a downward spiral. It’s not as dire as it sounds, however. By making Alex an inventor, the show’s given itself a comedic through line in the prospect of his not-so-great creations (here, it’s the “switchfork,” a set of chopsticks with a built-in fork, a better version of which already exists). Grazer also proves himself to be a strong comedic presence, his bug-eyed fastidiousness serving as a nice contrast to his new step-brother, Justin (Christopher Paul Richards), who subverts the traditional step-brother tropes by being weirdly, almost creepily supportive of Alex. That said, Justin, like White’s Darryl and the rest of the series’ supporting characters, feels curiously amorphous, an identifiable archetype that’s nevertheless also something of a blank slate. We understand what function they serve in Alex’s life, but they also seem to have no lives of their own, which brings us to the challenges of essentially mashing three sitcoms into one. What really connects these timelines is that each finds Alex in the midst of a huge life change—moving to a new city, divorcing his wife, and retiring. That each could ostensibly function as their own show contributes to the show’s sense of familiarity, but it also presents a high hurdle, Telling three stories across the course of 30 minutes (21 when you factor in commercials) leaves you with roughly seven minutes devoted to each timeline, which leaves the writers with the unenviable task of writing three mini narratives that cumulatively amount to one thematically consistent, emotionally satisfying episode. This isn’t The Wire; you can’t just send some characters to the sidelines for an episode or serve up an entry that’s more or less devoted to table-setting. We watch sitcoms because they demand so little of us. Satisfying on an episode-by-episode basis is what they’re meant to do. It’s easy to crack jokes in seven minutes, but how long will it take you to build believable worlds (especially when one of the three takes place in the sorta-distant future)? There are plenty of jokes in this episode, but few are going to elicit anything beyond a mild chuckle. Young Alex’s mint-swapping fallout with Nori is an effective bit of business, and present-day Alex’s complete inability to find inner peace should strike a chord with anybody who’s ever felt an ounce of anxiety, but future Alex’s story leaves no lasting comedic impression, aside from seeing a few of his earlier self’s tendencies still creeping into conversations. And this might be a consequence of saddling your purest comedic talent, Moynihan, with issues like divorce, child custody, and poverty. To this point, Moynihan’s built a career serving as zany side players lacking any semblance of subtlety. He’s funny, sure, but he’s untested as a sympathetic lead. As such, what we get in the pilot is a decidedly dialed-back Moynihan who’s really leaning into the more dramatic aspects of the role. It’s an odd fit and not always effective, but the actor’s earnestness and innate likability goes a long way. “Likeable” is a good word to describe Me, Myself & I. It lacks edge, oozes sentimentality, and is wanting for more laughs, but it carries itself with confidence and moves with a briskness that complements its affability. Its greatest potential, however, lies in its ability to fold the comedic and emotional weight of time’s passage into an otherwise straightforward story. Sustaining that gimmick into the foreseeable future, however, won’t be easy. The voiceover narration is helpful in terms of transitioning between timelines, but I hope they ditch it once the show settles into itself. It’s distracting and corny, even if it does kinda-sorta recall The Wonder Years. That’s Brian Unger playing Alex’s tough, well-meaning stepdad, though you probably know him as the embattled, conniving lawyer that the Gang refuses to let alone on It’s Always Sunny in Philadelphia. Seeing Fargo’s Allison Tolman pop up in such a small role made my heart ache a bit for the loss of Downward Dog and what was probably our last shot at getting the goddamned talking animal show this world needs. He’ll always be Urkel, but Jaleel White’s had a truly fascinating career. Peek at his IMDB page next time you hear somebody pull a “whatever happened to THAT guy?” on him. Share your thoughts in the comments and let’s chat about this thing. Sitcoms still matter in this era of prestige TV, after all.